I love when readers contact me about some of the stuff they come across. Today's post features two of these finds. Here's the best thing I ever found in a book: an ad, dated ca. 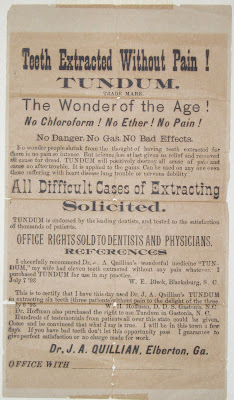 1893, for "Tundum - The Wonder of the Age," an anaesthetic for tooth extractions. I found it in a trove of old books that came to my father (later to me) after the death of a relative in central Georgia. Most of the books are glorifications of the Confederacy like Thomas Nelson Page, _Two Little Confederates_ (New York: Scribners: 1905)--pretty distasteful stuff. But I think I probably found it in a torn up and fragmentary copy of Andrews' Latin Dictionary. Since I was so amused by it my parents had it framed; and that explains the discoloration. I used to think that the substance was probably cocaine, but I understand that cocaine was injected when used in dentistry. Thomas D. Luke, Anaesthesia in Dental Surgery, 2nd ed. (1906) reports that certain volatile compounds were applied directly to the gums as a "refrigerating agent." Next up is Rose, who found this gem in a copy of "The Collected Poems of W.B. Yeats"
Fourth Prize - Peggy S??? Pasted in is a newspaper article about the contest. Thanks Rose and Peter - and if any of you have something to share, drop me a line. I guess it was too much to hope the Wonder Drug ad had been found in McTeague. Thomas Nelson Page was my great great uncle. This seemed cool to me until I got my hands on a number of his books while on a trip to New Orleans. Yep, pretty distasteful stuff. Meanwhile, I write about high brow stuff like potty training and barf. It must be genetic. I adore this site. I have a huge blog crush on it.